Every so often, a product comes on to the market and, rather suddenly, it seems that everyone has to get his or her hands on it. For a well-prepared business, this is a great opportunity to increase revenue and gain new customers. However, if a business is unprepared, the surge in demand can result in an array of issues, from inventory shortages to product stock outs. A recent example of this business phenomenon was the surge in demand for solar eclipse viewing glasses. The entire country was anxiously anticipating the solar eclipse and began frantically purchasing the specially made glasses. The huge uptick in orders for the glasses resulted in a slew of problems for companies selling them. From stock outs to refunds to unhappy customers everywhere, what could these companies have done differently to change these outcomes and to better prepare for the surge in demand? Demand planning or sales forecasting is the estimation of how much of a product a customer will be purchasing from you. Estimating demand and anticipating sales will allow you to have a plan to prepare for spikes in demand. Sales History: Look at the sales history within your industry and company. This data will be a good indicator of what your sales can be in the future. While combing through sales history, patterns will emerge, you will see periods of growth, and learn which times of year are busiest or slowest. Your Audience: Understanding and knowing your audience will help predict their behavior. Look at their purchasing habits, which promotions they were most receptive to, their ages, and their locations. Trends: Monitor trends within your industry and demand for your products. Read reports, watch the news, and follow relevant blogs. Frequent websites like the National Retail Federation that compile demand forecast reports and news on recent market trends. Category 2: products between 10-20% of your inventory. Category 3: products between 20-50% of your inventory. Category 4: products in the bottom 50% of your inventory. Once you have the rankings in place, calculate safety stock levels: the amount of each product you need to have on hand in order to not go out of stock before a new shipment inventory arrives. Having safety stock will allow you to have a buffer for when demand for your products increases unexpectedly. Category 1: These are your top performing products. You should have the most buffer here. Double your safety stock number to determine a good minimum stocking level for products within this category. Category 2: Items in this category are also top sellers. Create the minimum stocking level by multiplying your safety stock amount by one and half times. Category 3: Keeping inventory at the level of your safety stock is sufficient for this category. Category 4: For your lowest selling products, order when purchased, if you have a short lead time. Otherwise, keep a small amount available to ensure that your shipping delivery times are not affected. Also, think about working with a supplier who also fulfills these items. When demand for your products surges, you will be busy fulfilling orders and interacting with the customers. Accurate inventory tracking may be the last thing on your mind and could fall behind, resulting in stock outs and overselling. To better allocate your time and resources, it would be wise to consider an ecommerce inventory management software. An inventory management software easily tracks and syncs your inventory across all sales channels, in real time, saving time and helping to eliminate stock outs. With an inventory management solution like ecomdash, you will have the peace of mind knowing your inventory is being accurately managed and have more time to focus on other aspects of your business. Even with the best systems and planning in place, stock outs and overselling can still occur. If this does occur, being transparent with your customer is key to keeping their trust in your business and cultivating good relationships. Update your listings to accurately reflect their out-of-stock status, accompanied by a sincere, apologetic message. Offer to send out email notifications to interested customers when the product is back in stock. If the product was discounted when it went out of stock, consider offering a rain check on the discounted price to further ease your customer’s mind. Taking the extra time to forecast and have good inventory management practices will pay off in the long run. Planning for demand and having systems in place to prevent stock outs are very important for the health of your business, and your customers will appreciate it too. Want to become an ecommerce inventory expert? 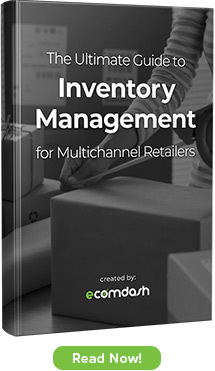 Read our ultimate guide to multichannel inventory management for everything you need to know about managing inventory across multiple platforms.